Anyone who has spent time watching badgers at their sett will know that they spend a significant amount of their time grooming. The most prolonged bouts of grooming tend to occur shortly after emergence from the sett, but it is not uncommon to see a badger sit down and scratch in the middle of a bout of feeding. As well as grooming themselves, they also groom other clan members; a behaviour known as allo-grooming. Badgers meeting and engaging in allo-grooming in a Suffolk garden. Note that the mutual grooming is focused along the back and rump, areas badgers struggle to reach themselves. Credit - Alan Baldry. This means that allo-grooming badgers direct their attention to those areas neglected by the recipient. Furthermore, the researchers described how adult badgers groom one another using a “responsive rule set that dictates that grooming can be initiated generously, but rapidly withdrawn”. In other words, one badger will start to spontaneously groom another and, if the recipient reciprocates, will continue until one stops. If the recipient doesn't reciprocate, the initiating badger will stop. This ensures that badgers don't need the elaborate “scorekeeping” system that we see in other socially reciprocative mammals. The exception to this “rule” seems to be females who will groom young cubs that are unable to reciprocate, and smaller individuals that are sometimes observed to groom larger animals, even without reciprocation, perhaps to try and earn favour among what were likely to be the more dominant animals in the clan. Some patterns were also evident, such as the shoulders frequently being the initiation site when grooming a new partner. In their 2003 paper on the strategies and counter-strategies of badgers and their fleas, Paul Stewart and David Macdonald at Oxford University's WildCRU observed that fleas moved away from the grooming site only to return a few seconds later once the disturbance had ceased, presumably explaining why grooming takes the form of a series of short, repeated activity and why they alternate sides during a bout of grooming. During grooming there was a tendency for fleas to retreat towards the rump and tail, which were less accessible to the badger, hence the benefit of allo-grooming. Interestingly, Stewart and Macdonald found no evidence that grooming reduced flea burden, although they do suggest it is a possibility - fleas hardly ever jumped off their host in response to grooming. In a short communication to the Journal of Zoology in 1977, Phil Drabble reported on the recordings made at an enclosed sett he was studying in which two adult badgers, a boar and sow, were kept. Based on his interpretation of the recordings, specifically “loud teeth clicking and licking”, the boar entered the sett chamber where the sow was sleeping, waking her up. The pair then engaged in mutual grooming unabated for ten minutes before the female apparently tired of it and growled in protest, after which “the grooming continued at declining tempo until they both fall asleep”. This suggests that mutual grooming happens below ground prior to emergence as well as above ground. 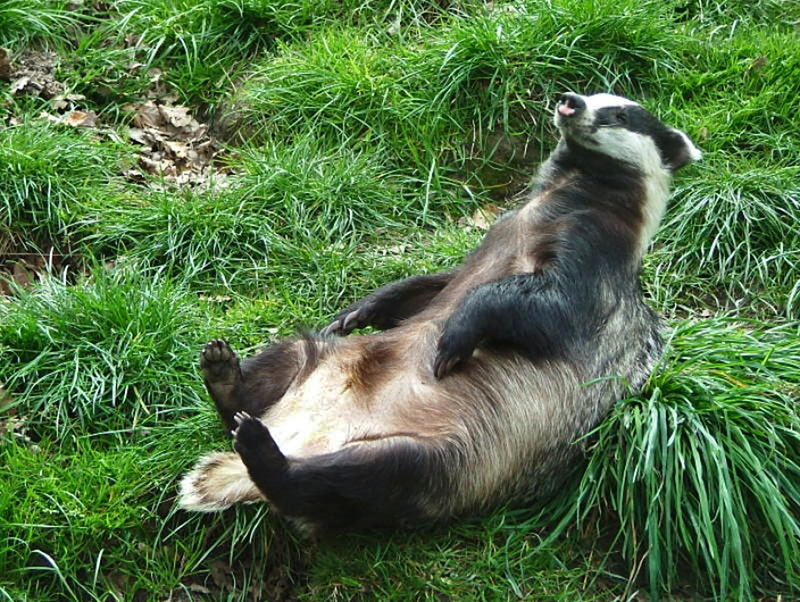 In their 1996 opus, Badgers, Ernest Neal and Chris Cheeseman recount several personal observations made to them on the grooming behaviour of badgers. Katharine Tottenham, for example, observed a badger pull a thistle out of some bedding and, holding it between its front paws, proceed to scrub its chest. This happened every time the badger was presented with a thistle. Another interesting report came from John Sankey who described how, when he rubbed his tame badger’s back vigorously with his fingers or combed it, it would at once start to groom itself, a piece of cloth or Sankey’s hand, whatever was in easier reach. This suggests allo-grooming is an automatic reaction in badgers. Neal and Cheeseman also described licking behaviour, which often took place when they returned from foraging. Licking was akin to that of a cat washing itself, although badgers don’t appear to use their paws to clean their face. Mutual licking is also observed occasionally, with one account of a boar and sow facing one another before licking each other’s face, neck and back. Unlike for the Red fox, none of the data collected to-date suggest that grooming is important for the social cohesion of the clan, although this cannot be ruled out.